Retaining Compound - high strength. High-temperature resistance. LOCTITE® 620 is designed for the bonding of cylindrical fitting parts. The product cures when confined in the absence of air between close-fitting metal surfaces and prevents loosening and leakage due to shock and vibration. Typical applications include locating pins in radiator assemblies, sleeves in pump housings and bearings in auto transmissions. Particularly suitable for applications where temperature resistance up to 200°C is required. Common Applications: Ideal for applications including retaining locating pins in radiator assemblies, sleeves into pump housings and bearings in auto transmission etc. 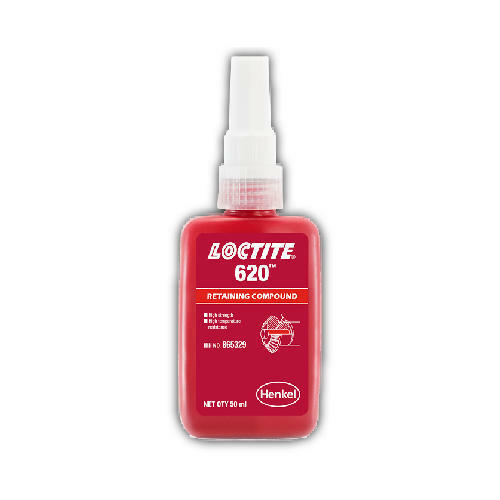 An integral part of the Henkel portfolio, LOCTITE is known for quality adhesives and sealants. Since the development of anaerobic technology, LOCTITE products have become vital components in several machines and assemblies across industries.